Stigma toward mental illness embodies the belief that mentally ill people caused their illness. It associates mental illness with shame, infamy, and disgrace. How much stigma toward mental illness exists? It’s difficult to measure. Organizations expected to advocate for the mentally ill population, including the National Alliance on Mental Illness (NAMI) (StigmaFree | NAMI: National Alliance on Mental Illness, bit.ly/2AaGvie. ), appear to overemphasize stigma as a problem. They portray it as a massive problem and urgently promote campaigns to eradicate it. Toward the beginning of my career, I grew to believe that stigma was the greatest barrier to accessing sound mental health treatment. I didn’t realize then that I allowed myself to be influenced by the many campaigns against stigma that were advertised. Is stigma less problematic than what the media and certain organizations make it out to be? Is the extent of the stigma that they claim a myth? Although stigma associated with mental illness exists, it is apparently not the greatest barrier to accessing treatment. The Recovery Learning Communities (RLC) are groups, largely dominated by peer specialists, throughout Massachusetts that endorse the belief that signs of psychosis are normal. Besides running frivolous reiki groups, they regularly lead groups for their members titled “Hearing Voices.” They advertise that “Hearing Voices groups do not pathologize the experience of hearing voices or experiencing other altered/extreme states. Instead, they ask “What does the experience mean to you?”" (“Western Mass RLC | Healing and Recovery Through Peer Support.” Calendar, Western Mass Recovery Learning Community, 8 Nov. 2017, bit.ly/2yFc5Fc.) To pathologize a human experience means to view it as abnormal or dysfunctional. Hearing voices that are not there is certainly not normal. Science proves this. If impressionable people aged in their early twenties experience auditory hallucinations that involve commands to kill themselves or others for the first time and attend these groups, the chances that they will seek out appropriate treatment are reduced when they learn that nothing abnormal is going on. For months in a row in 2017, Western Mass Recovery Learning Community has advertised their seminars, titled Coming Off Psych Drugs, that have taught and encouraged people to stop taking their prescribed psychiatric medication (Davidow, Sera. “Western Mass RLC | Healing and Recovery Through Peer Support.” Coming Off Psych Drugs, Western Mass Recovery Learning Community, bit.ly/2vfutCo.). When they do not deny the existence of mental illness, RLC minimizes it. Minimizing mental illness is not far off from believing that it doesn’t exist. If prospective followers of the anti-psychiatry camp are not persuaded to believe that no mental illness exists, they might be influenced to minimize mental illness, which contributes to stigma. The government allows the belief that mental illness does not exist to infiltrate them. Massachusetts’ Department of Mental Health funds RLC (United States. Executive Office of Health and Human Services. Department of Mental Health. Search Results. Commonwealth of Massachusetts, 2017. bit.ly/2yFDQNW.). NAMI's Massachusetts chapter promotes RLC (“PEER SUPPORT RESOURCES.” Peer Support Resources | NAMI Massachusetts, National Alliance on Mental Illness, bit.ly/2iD6wMt.). 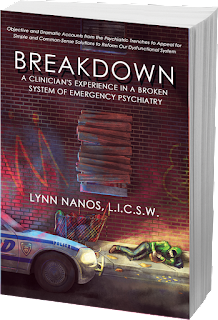 When I started working on an inpatient psychiatric unit as a social work intern for the New York state's Office of Mental Health in 1996, my supervisor told me, "No one here is mentally ill." She was never part of the anti-psychiatry group who believe that mental illness doesn't exist. By stating this, she meant that many of these patients didn't believe that they were ill.
Psychiatric emergency services work can be akin to watching a train wreck without any ability to prevent the wreck from happening. When will the next tragedy involving serious injury or loss of life due to untreated serious mental illness occur? Governments are reactive. The severe shortage of inpatient psychiatric beds along with overly restrictive inpatient commitment criteria often result in only the sickest of the sick getting admitted to inpatient units. For people with psychosis who lack awareness of being psychotic, brain deterioration often occurs long before sufficient psychiatric treatment is obtained. Early psychosis programs are completely voluntary, thus marginalize those who refuse to engage in treatment because they don't believe that they are ill. I go to a psychotic woman's apartment with an outpatient worker because she stopped eating. She stopped eating because of her belief that people are poisoning her food. Because she believes that poisonous gas is coming out of her heating vents, she covers these. Because she believes that poisonous gas is coming out of her faucets, she keeps the water running continuously. She believes that running the water blocks the gas. As we are standing in water inches deep, she tells me that she is not mentally ill. Therefore, from her perspective there's no need to take any medication. The police are called and an ambulance transports her to the hospital emergency department. The emergency medical doctor calls and tells me that because she is well groomed, speaking clearly, not suicidal, and not homicidal, she is being discharged back to her home. Everything I report to them is disregarded. I'm just a social worker. Would she be moved on to inpatient if I am a psychiatrist or medical director of an agency? Would she be moved on to inpatient if she has a family member to advocate for her? Weeks later, she is evicted from her apartment with nowhere to sleep except for the streets. A psychotic man got discharged from Bridgewater state "hospital," really managed by the Department of Correction, earlier that week. He was there because he was eating his feces and cutting himself to remove what he believed was the devil from his body while incarcerated. He yells out his fears of the devil when I evaluate him at the state-funded respite unit. He tells me that he got sentenced to prison because he pointed a loaded gun toward a stranger. I inquire about what made him do this. He says that the devil told him to do it. He doesn't believe that he is mentally ill. Emergency medical doctors are more likely to discharge to the streets a dangerous patient who is not wanting any treatment, than a dangerous patient who is wanting treatment. They are more likely to move on to inpatient the malingerer who doesn't need treatment, than a psychotic patient who can "pull it together," and cover up symptoms. 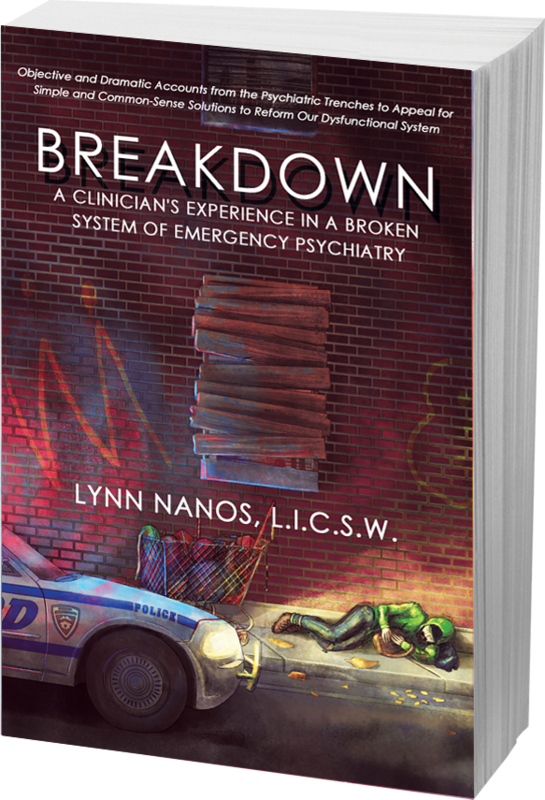 One of the most challenging cases I ever managed involved sending a patient with antisocial personality disorder to the hospital emergency department involuntarily because he was actively homicidal with an intention, a plan, and a means to kill a targeted peer in the homeless shelter. I could barely identify any other mental abnormality in his clinical presentation. In making the decision to authorize his involuntary transport to the hospital, I used past knowledge, weighed various options and probable outcomes, and reflected on how to promote the safety of all involved. Within a couple of hours later, I was challenged by the hospital emergency medical doctor there, who told me that antisocial personality disorder was not enough of a mental illness to warrant any treatment. This doctor then discharged him to the homeless shelter. Personality disorders are considered minor mental disorders, deemed not serious by official regulatory and authoritative standards. So was I expected to send him off to the homeless shelter to kill this peer? Then I came across a publication by the National Alliance on Mental Illness (NAMI), whereby they educate the public about mental illness in a section titled “Mental Health Conditions.” As I saw the many instances in which they use the word “condition,” I thought about how mental illness should not be referred to as a “condition.” Many advocates for the seriously mentally ill population oppose NAMI’s use of the word “condition” because it softens the illness. I agree that the term “illness” appears stronger than “condition,” and thus more indicative of pathology than “condition.” Describing mental illness as a “disease” is even better. According to a dictionary, “A medical problem or illness can be referred to as a condition.” Did NAMI get it right? Or, did this dictionary get it wrong? Mental = pertaining to the mind. Mind = capacity to feel, think, perceive, and reason. Soul = feelings, thoughts, behaviors that are typically considered as separate from the physical body. Some religions view this as immortal. Psychiatry and neurology separated because mental disorders could not be attributed to any physical evidence. Hence neurology took over the study of pathology that was tangible, while psychiatry studied abnormalities that could not be seen. Despite the fact that the ability to feel, think, perceive and reason originates in the brain, many dictionaries still define “mental” as unseen material. Indeed using the term “mental illness” softens and minimizes the seriousness of brain abnormality. With a bit of guilt, I will consistently use the terms “mental illness” and “mental health” throughout my book. I apologize for this. The reason for sticking to these terms is simple. These terms are so deeply ingrained into the fabric of my professional work and its surrounding field, that not using these terms would draw less of an audience. Technology has advanced to the point where schizophrenia, commonly known as a “mental illness,” is physically evident in magnetic scans of the brain. Even features of antisocial personality disorder, such as lack of empathy, are physically evident in the brain. I believe that psychiatry and neurology should merge and become one entire discipline. This would lessen or completely alleviate stigma toward "mental" illness.